It should go without saying that coaches shouldn’t give their own children preferential treatment -- eg unearned extra playing time. But also to be avoided is treating one’s own child more harshly. 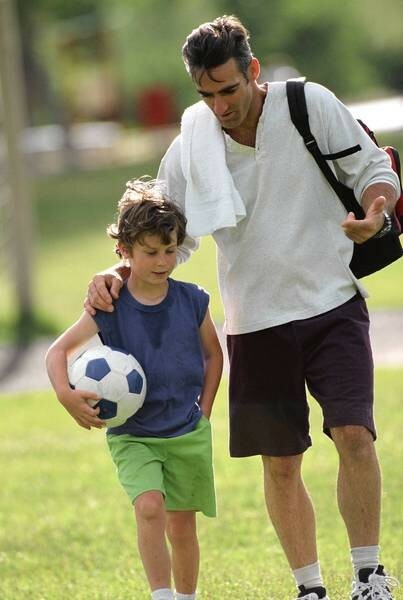 "You must also recognize that you're likely to be harder on your own child than you are on the other players and deal with it accordingly,” says DiCicco “Don't be afraid to praise your child. If you let your daughter know when things aren’t happening the way they should, then make sure you hit the high notes as well. Acknowledge her strengths and accomplishments at every opportunity." The good test on how to treat your child on the soccer team is to constantly ask yourself if your reactions to his play or behavior are the same as they are to his teammates. Another peril of coaching one's own children is leaving your coaching hat on when the game or the training is over. "I think what [parent-coaches] must be most aware of is keeping what takes place on the training ground and what happens in games separate from what goes on in your home life. Don’t let things carry over, either way." The PCA recommends you explain to your child, "I always love you and you are special to me. But when I'm coaching you, I need to treat you like all the other players. And you need to respond to me as your coach, not your dad. Do you think you can do that?" One idea the PCA advises is to employ the "coaching hat." Explain to your child that when you're donning the cap, you're coach. When practice is over, the hat's off and you're back to parent. An assistant coach offers a convenient solution for keeping the parent-child dynamic from creating tension: Have the assistant handle coaching communication with your child when one-on-one chats are called for. Among the best youth coaching advice I’ve ever heard, whether your kid’s on the team or not, is to see the game through the children’s eyes. This will remind you that the most important contribution you can make is to help the kids have fun -- and not to treat 6-year-olds like 16-year-olds. Says DiCicco: "No matter what, understand that there are going to be some difficult moments and that, in the end, it is often better to coach less than more."